Currently there is a broadly based consensus that world food production needs to increase by 70 per cent by 2050 and that Australia should increase agricultural production2. As an example, the Queensland Government plans to double food production by 2040. On the demand side this consensus is based on predictions of food shortage and the expected growth in Asian demand for higher priced agricultural products.The potency of these demand-side factors is accentuated by a perceived need for an economic transition froma high dependency on minerals and energy and by an understandable angst in agriculture as a result of the prolonged high value of the Australian dollar. The purpose of this paper is to suggest that we need a more ﬁnessed response than pursuing production for production’s sake. Essentially, we need a focus on proﬁtability and ecological integrity3. Two aspects of the current predictions of food shortage, somewhat sensationally also termed ‘famine’ leading to concerns about ‘food security’, warrant attention. First, it should not be taken as a given that the future will bring greater food shortages than exist today, at least not as translated through global markets. The predicted rate of population growth over the next forty years (7 to 9.6 billion) is less than half what we have experienced over the past forty years (3.5 to 7 billion). Most of this growth will be in less developed nations relatively unconnected to global food markets. And after forty years the population is predicted to actually decrease. In this context, it is important to note that, globally, there are considerable untapped natural resources. For instance, world-wide the area dedicated to cultivation could expand by one third, and only 5% of African agriculture is irrigated in spite of there being extensive regional water resources4. Particularly given the exponential growth in our technological capability we can expect rapid rises in production in response to sustained rises in prices. For both animals and crops, there are large gaps in yields between what is possible and what is realised. Furthermore there are fourfold productivity differences between farms of similar size in terms of gross receipts5 indicating potential for further productivity gains. Pre- and post-harvest losses are large. 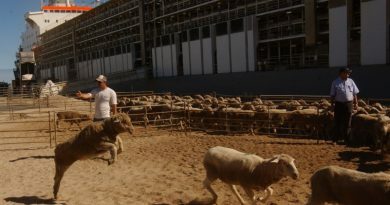 Second, and irrespective of the magnitude of a shortfall in food production, an Australian policy response to encourage increased production may be misguided. The most acute food shortages occur in agro-political zones characterised by a large, inadequately educated rural poor, small farms, lack of infrastructure, isolation from market forces and poor governance. About half the world’s poor live in rural areas with impoverished soils, irregular rainfall and inadequate infrastructure. To be effective the response to food shortages in these regions needs to be endogenous encompassing better government structures and practices , removal of education and soft and hard infrastructure constraints, improved production and marketing strategies and improved capacity for self sufﬁciency and good environmental management. This approach creates a positive feedback loop between improved production, reduced poverty and the adoption of more sustainable practices. It is a triple win6. In general terms, shortages of food in ‘famine’ prone countries will not be solved by increased production in countries like Australia7. In fact, excessive exogenous production and/or subsidising this production may well constrain the evolution of improved agribusiness-based capabilities in regions of greatest need. Furthermore, there are well-based concerns that sensational reporting may lead to export restrictions and other inappropriate policy responses. The second source of increased demand for food will be changing dietary habits in parallel with improved standards of living. In general this demand will be exercised primarily through price sensitive markets eliciting rapid and substantial increases in production. In fact some conclude that a sustained rise in food prices over coming decades is unlikely. (see article on FAO world food price projections in the fostering debate section this web site). So, from a demand side analysis, a probable scenario is that rather than focusing only on increasing production, Australia should identify and service consumer needs in relatively price insensitive high end markets. 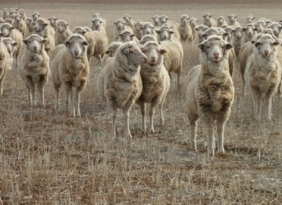 To drive home this message it is instructive to look at the past to get a clearer picture of what might be a sound Australian agricultural response to anticipated global changes in demand for agricultural products. Let’s look in very general terms at what has happened over the past ﬁfty years. The ﬁrst thing is that the value of world trade in agricultural products and the volume of Australian production have risen two and a half to three fold or thereabouts. This is a much more dramatic rise than the 70 per cent rise or thereabouts in production terms deemed necessary by the food famine-food security school until the world population peaks in about 2050. Even with two-and-a-half to threefold increase in agricultural production in Australia the real gross value of agricultural production – the gross value corrected for inﬂation – has changed very little. We should well ask why this lack of change in real gross value will not be repeated over the coming decades, ﬁgure 1. Figure 1:. Agricultural trends in Australia, 1950 – 2010. The situation is even more sobering when one takes account of the fact that 70 per cent of the current real gross value of agricultural production can be attributed to past productivity growth11. This growth has come from producing more from the same rather than the same from less, there being little change in the real aggregate costs of production. Additionally, much of the increased production has come from dramatically increased use of water for agriculture. Notwithstanding the growth in world trade, production and productivity, there has been a steady decline in aggregate real net farm cash income12. The natural resource base has deteriorated and many argue there has been a comparable deterioration in social capital. The lesson we might take from this is that Australian agricultural producers should respond to market requirements and price signals rather than to calls for increased production. In other words, governments, industry and landholders need to focus on proﬁt and ecological integrity. 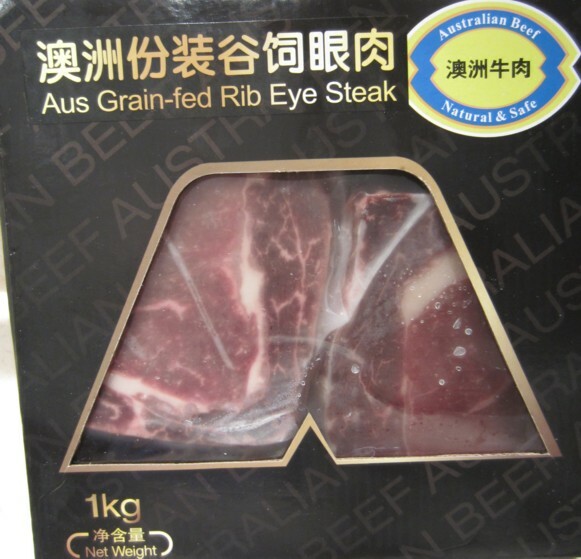 For Australian agriculture this involves working back from consumers and customers along value chains, preferably in higher priced discerning markets where competition is based on value rather than on price alone. We need also to note that at least half the value along these product chains represents direct and indirect inputs from the service and manufacturing sectors13. There are many approaches that might be employed to improve farm proﬁtability ranging from improved trade access, commercial co-funding along value supply chains, improved infrastructure, particularly in transport and digital communication, greater use of business structures involving farmers in the product chain and protection of the natural and human resource base. These are best viewed as intertwined and interdependent approaches. The rest of this paper posits that we need to and can have integrating strategies that improve on-farm productivity and farm proﬁtability and enhance the natural and human capital so necessary for the future sustainability of the agricultural sector. Innovation in natural resource policy and practice is a critical element. The desirable direction of that innovation is well articulated by numerous authors. ‘On-farm natural resource management is an area of Australian farm policy sorely in need of serious innovation. It seems the whole policy area is locked into a mentality of regulatory decrees and ﬁve-year plans and indifference to measuring real outcomes. Leadership is required of governments in taking a much bolder and more sustained approach to the use of market-based-instruments (MBIs) as a core component of natural resource management (NRM) policies, underpinned by sensible, outcome-focussed regulations. The focus should be on mechanisms that maximise real improvements in NRM by involving farmers as willing volunteers rather than as surly conscripts’. In the same (Australian Farm Institute) journal Parker observed that the obvious disjuncture between agricultural development and environmental and social sustainability testiﬁes that today’s institutions, public policy and markets are not delivering a sustainable agriculture. Clay advocates substantial transforming innovations in natural resource management policies and programs, including taxing on pollution, paying for ecosystem services, removing distortionary agricultural subsidies and developing of win-win agro-ecological technologies and management systems. Interestingly, Clay claims that ‘‘subsidies from nature probably represent as much as ten times all the subsidies from governments combined’. encouraged innovation so fewer ‘free riders’. Parker cites four broad types of markets, in declining order of government involvement, as being public payments to private landholders, open trading under a regulatory cap or ﬂoor (e.g. with carbon emissions), self-organised private deals and eco-labelling of farm products. Parker cautions against establishing markets for ecosystem services that crowd out moral and cultural drivers, a phenomenon well articulated more recently by Sandel. Parker also notes the need to avoid inconsistencies between local and distant needs and impacts which can occur with offset mechanisms and tradeable rights. To improve natural resource management Goss and Pinstrup-Anderson advocate connecting natural resource management with the mainstream agricultural innovation system and delivering environmental services through a market-based approach. The ﬁrst of these objectives was a major reason for establishing the Rural Research & Development corporations through the late 1980s/early 1990s, and both objectives were at the centre of the development of the National Framework for Environment Management Systems (EMS) in 2002 and subsequent national funding programs. None of these initiatives, however, delivered on its full potential. It is worth exploring why innovation in natural resource management is seemingly so problematic. 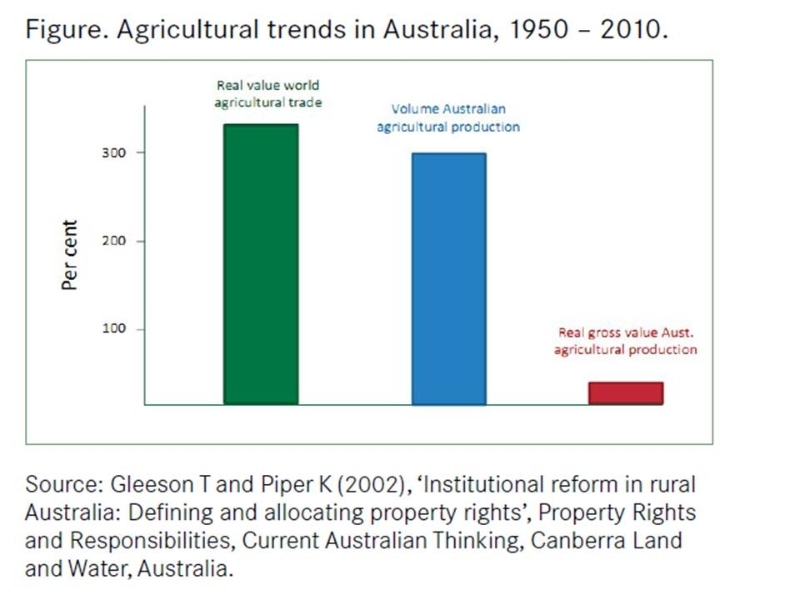 Gleeson, Drinan and Turner reported on the insensitivity of Australian rural policies to changing Australian values and aspirations brought about to a large extent by the isolated and specialised institutional arrangements pertaining to agriculture. This institutional rigidity establishes boundaries around the agricultural innovation system which arguably is overly focused on incremental cost saving production technologies. Innovation, which is the process whereby new and valuable ideas are put into practice leading to system- wide adjustments, depends heavily on creativity and insight, in both the discovery and the adoption phases. Innovation is a multi-faceted social phenomenon; creativity and the insight it depends on are personal phenomena. Particularly but not uniquely in the natural resource policy and program framework, creativity and insight are constrained by premature problem deﬁnition and excessive prescription of goals, outcomes and methodological steps by those who act as the innovation gatekeepers. Notwithstanding the gap between expectations and reality, there has been little if any innovation since Landcare (commenced) in how the gap might be reduced. Instead, we have been relying on the goodwill of landholders, and on more regulation, short-term projects and education, training and research and chatter about narrowly conceived MBIs. Landcare itself has been drawn into the dominant project paradigm where good intentioned people other than the landholder (the primary investor) determine priorities and time-frames for support and impose creativity constraining, expensive and ineffective accountability arrangements. Current or increased levels of production can only be maintained or increased if the natural resource base is enhanced or, at worst, at least protected. It was against this backdrop that the Certiﬁed Land Management (CLM) system was conceived, developed and reﬁned. As acknowledged earlier, improving farm proﬁtability requires a portfolio of intertwined and interdependent innovations. Certified Land Management (CLM) is one thread in this web of innovations to improve on-farm productivity and farm proﬁtability and to enhance the natural and human capital so necessary for the future of the agricultural sector. CLM is a management system to support superior land and animal welfare management in ways that improve farm proﬁtability and enable the achievements of landholders to be recognised and rewarded. These are important outcomes with private and public beneﬁts. The design of CLM is based on the premise that land management performance is constrained by institutional factors, in particular by market failure. Essentially, market failure exists when markets do not account for outcomes that are in whole or part public goods, for externalities and for organisational, spatial and temporal fragmentation due to organisational and legislative factors. The design of CLM reﬂects the potency of markets in inﬂuencing behaviour and the balancing need to enable altruism. CLM is designed to be a complementary instrument in particular to regulation and to education, training and research. CLM was conceived and designed with inputs from people with deep experience in particular domains or broad experience across domains, from practical and conceptual perspectives. It is not surprising then that it does not lend itself to be slotted into a particular category of tools or instruments. CLM delivers multiple beneﬁts to motivate and enable landholders to improve environmental and animal welfare management. These beneﬁts can be categorised as being internal or external and they are enabled because of the certiﬁcation per se and because of the processes that lead to the certiﬁcation. The range and potential magnitude of beneﬁts to landholders are important but they are only part of the CLM story. Additionally, CLM is an effective and efﬁcient conduit for delivering public sector support for superior environmental management and it is an effective tool for marketers of food and ﬁbre to differentiate their products on the basis of the ecological integrity of their production. The use of CLM to deliver recognition and reward avoids the ecological fragmentation and consequent perverse impacts normally associated with market based instruments narrowly focused on just a part of functioning of ecosystems. The problems associated with that reductionism are well articulated by Tennent and Lockie and by Lindenmayer, Hulvey, and Hobbs. “Our edge [in Asia] will be as a reliable supplier of high margin, safe, green and high quality food. Australia must strive to be the “developing world’s delicatessen”, deliberately avoiding competing in a “low-margin supermarket role”. Certiﬁed Land Management can play an important role in meeting the challenges facing Australian agriculture whilst at the same time protecting and enhancing the natural resource base and strengthening social connectivity. Tony Gleeson tony.gleeson@almg.org.au www.almg.org.au ; references are available from the author.